>Gerry Garvin is an American acclaimed chef, cookbook author and TV host. G. Garvin is most widely known for his television series, Turn Up the Heat with G. Garvin, which ran for seven seasons on TV One. The show’s increasing popularity earned the talented artist a second series on the same network entitled G. Garvin: The Road Tour, which premiered in 2007. Garvin also appeared in a Cooking Channel special, Georgia Roadtrip with G. Garvin. He is America’s most down-to-earth chef, and his claim to fame is showing everyday cooks how to keep it simple with a Southern twist. Garvin’s impressive resume and philanthropic efforts have warranted such accolades as the 2007 Man of the Year award by Women Moving Forward in Business and Third Best TV Chef by Southwest Airlines’ Spirit Magazine in 2006 (behind Jacques Pepin and Emeril Lagasse). Additionally, Garvin has been a popular guest on both The Tonight Show with Jay Leno and Good Morning America. Garvin is also a notable author. His first cookbook, Turn Up the Heat with G. Garvin (Meredith Books), was published in October 2006. Its widespread success quickly prompted a second printing and won an American Literacy Award. It was also chosen for the 2006 Library of Congress National Book Festival. Garvin’s highly anticipated sophomore effort, Make it Super Simple with G. Garvin, a collection of recipes for super-simple, healthful and delectable dishes, was released in February 2008. Garvin’s third cookbook, aptly titled Dining In, was released on October 7, 2008, and features all-new, fine dining recipes that will enable even the most inexperienced cooks to create the most impressive gourmet meals in their own homes. Garvin has since written other books, Answers to a Young Culinarian, and is currently working on The Sandwich Bible and Live Love Eat and Prayer. He also has The Memoir being published in Brazil in Portuguese. Garvin has mastered offering a one-size-fits-all approach to cooking — sophisticated simplicity — proving that even the most basic cooking palate can create the most flavorful of dishes. Ever the entrepreneur, Garvin has developed his own line of spices, called G. Garvin Spices, and is currently working on national distribution as well as a line of barbecue sauces, vinaigrettes and a two-step frozen ravioli brand. To further make an indelible mark on the culinary world, Garvin is working passionately on his culinary boot camp for kids ages 16 to 19 through the One Bite at a Time Foundation. The camp will offer an experiential education in hospitality and restaurant operations management, as well as culinary arts. Through this effort, Garvin hopes to aid in breaking down the diversity barriers within the cooking industry. Additionally, his memoir, The Making of A Chef, has been sold to HBO as a series and is soon expected to be released. Garvin has great plans for his growing empire. His production company, One Bite Productions, will soon begin producing several distinct made-for-television programs. In a very unique way, he will use the culinary experience to help resolve conflict, teach life lessons and bring a new platform to help youth and adults cope with many of life’s common social issues. Beyond possessing business and cooking savvy, Garvin also holds a deep commitment to giving back. Raised by a single mother and a victim of domestic violence, he has been a continued supporter of the Jenesse Center, the oldest domestic violence intervention program in south Los Angeles. He has also become involved with Second Harvest, the nation’s largest charitable hunger relief organization, through ongoing partnerships with iconic brands such as Kraft, Tyson and Coca-Cola. 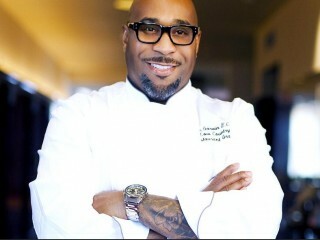 Garvin’s success as a chef, author, entrepreneur and television host did not happen overnight. The Atlanta native began building his culinary repertoire during childhood. His earliest experience came with cutting and peeling vegetables alongside his mother in the kitchen of Atlanta’s Jewish Home for the Aging. Being raised by a single mother and surrounded by four sisters, the determined 13-year-old Garvin traded after-school football practice for a job at The Old Vinings Inn in Atlanta, soaping dishes while soaking up the inner workings of a high-end kitchen operation. Two years later, he became the youngest cook at the downtown Ritz-Carlton, where he worked after school and during the summer. Garvin moved to the West Coast in 1988 to open the Ritz-Carlton’s Rancho Mirage resort in Palm Springs. Soon after, at the age of 20, he moved to Europe to further his culinary training and serve as an apprentice to Jean Pierre Maharebacha. There, he gained a wide range of on-the-job experience taking kitchen positions in Hamburg and Warsaw, documenting everything he learned. After nearly two years, he returned to Atlanta to become sous chef of the award-winning Italian restaurant Veni, Vidi, Vici. However, the lure of the West Coast drew him back, this time to Los Angeles. During the 1990s, he served as executive chef at Morton’s, where he orchestrated dinner for the 2nd Annual Vanity Fair Oscar fete, as well as a lavish banquet for the late Israeli Prime Minister Yitzhak Rabin. The opportunity to create “really good food” led him to the former Hollywood watering hole Kass Bah, where he shaped a creative menu appealing to serious gourmets and show-biz execs alike. A year later, he became executive chef at the restaurant Reign, which became an instant smash and earned Garvin his then-best reviews and highest salary. Yearning for both business and creative success with food, he left Reign to independently cater high-profile events, including two exclusive dinners for President Clinton, a private brunch for Senator Hillary Clinton and meals for other notable clients. After two years, he teamed with a catering client to open a restaurant. In fall 2001, G. Garvin’s opened to critical acclaim, and expanded two years later to more than double its size. Plans for a series of cooking DVDs brought him to the attention of TV One in early 2004, where his sophisticated simplicity and infectious enthusiasm seemed perfect for a new network looking to bring a broad range of lifestyle programming and entertainment to the tremendously passionate food audience. It was then that the idea of Turn Up the Heat with G. Garvin came to fruition. View the full website biography of Gerry Garvin.